It was really a good mail day! Even though my mailman was running so far behind that it was after 5 when he finally showed up. I really wish that we would get a regular mailman who would show up at the same time every day. Is that so much to ask for? Even though he was late, he brought three packages that really put a smile on my face. Actually any one of them would have done that but to get all three in one day was a bonus. First of all was rather mundane but much needed. I got a refill on my pain pills. Quite a necessity with my fibro and it will allow me to appreciate the others. The second package was a bunch of tea samples. For those that are new here, I am quite the tea addict and I review teas for TeaViews. If you enjoy teas, check them out before you buy a new to you tea. And I saved the best for last. 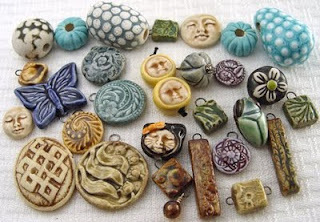 I received all those wonderful beads that won thru a contest at Laurel Moon Jewelry and Beads. It is a wonderful blog and I really recommend checking it out. Laurel also tossed in a couple beads that I think that she has made. Just gorgeous. One is of a dragon and my roomie is really eying it hoping that I am make a necklace for him out of it. I am going to try to get a couple pics of them this weekend. Speaking of pics. I really need to get some of a necklace that I made and promised to show to you all. I was going to get some pics this weekend but I couldn't find my camera. I had hid it from myself in one of the many pockets in my purse. Does anyone else have so many pockets in their purse so that they lose things? But anyways I have my camera and I just need to get some pics before the sun starts to fade away. Around here the best time is around 5 and I don't get off until after 6:30. But I haven't forgotten you all. Really. Wow! I love those beads! !